When Moises Mischne, a young Jewish boy from Mexico City, was planning his Bar Mitzvah trip to Israel, he probably wasn’t aware of what an incredible Mitzvah he would be doing at the Hadassah Ein Kerem Hospital in Jerusalem. Moises, whose hobby is to do magic, simply knew he would do a couple of tricks for some children. And indeed, on December 24th 2013, Moises became the illusionist who created the magic of bringing joy and smiles to sick children being treated at Hadassah. Moises is the grandson of Ruben and Toby Mischne, generous donors from Mexico City who have supported the construction of the new Sarah Wetsman Davidson Hospital Tower at Hadassah Ein Kerem. Ruben and Toby are also very important supporters of Hadassah’s activity in Mexico and play an important role in leading the effort in Mexico to help complete the construction and equipment of the Tower. During the visit, Moises was accompanied by his grandparents from both sides of the family in addition to another 20 members of his extended family. 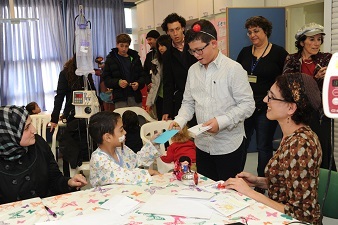 Among them were several children of different ages, for whom meeting sick children in Hadassah was their first opportunity to put into practice the mitzvah of Bikkur Cholim, visiting the sick. The visit started at the Mother and Child Center, where the Mexican group was welcomed by a mixed crowd of children who are hospitalized at Hadassah. The welcoming group was an illustrative picture of what Hadassah represents: an Arab boy from East Jerusalem next to another boy from the ultra-orthodox Mea Shearim neighborhood. They had prepared cards to congratulate Moises and his family, filled with beautiful drawings and messages they wanted to send to their new Mexican friends. But they were surprised to find out that the “Bar Mitzvah Boy” and his younger sister, Vanesa, were also there to give them a few minutes of joy. Moises and Vanesa asked some of the Hadassah children to volunteer for the magic tricks and both the Arab boy and the boy from Mea Shearim volunteered. They moved forward with their standing drips and wheelchairs, to become part of a short magic show performed with translation from Spanish to both Hebrew and Arabic. Applause broke out, and for one moment, they were just all one family celebrating, regardless of backgrounds and geography. The children who had come from Mexico then entered the Pediatric Ward to distribute presents they had brought from home: typical Mexican dolls — something that would make the kids in Hadassah remember their visitors from a far away country across the sea. Leaving the Mother and Child Center, the whole Mexican group stopped to view the plaque that recognizes the contribution of the Mischne family to Hadassah. It was a moving moment for the three generations of the family to be together, celebrating the joy of giving. As they walked to the new Sarah Wetsman Davison Tower, one of the family members said: “What we just did at the Mother and Child Center, we should do 365 days a year. I am so moved. I am carrying back with me a message to all my people in Mexico: if you want to do Tzedakah, this is THE place to do it”. Following a short tour of the new Tower, the Mishne family completed their visit at the Moses Saba Synagogue, the new Synagogue at Hadassah that was built through the generous support of another Mexican family, Alberto and Vicky Saba.